To have a proper estate plan, you will need either a will or a trust (or both). However, some property will pass outside of probate by other means. One such asset will be your retirement account. Once you identify who you want to receive your benefits after you die, you will designate them by naming them as a beneficiary on your retirement account. Before naming a beneficiary, however, you should give careful consideration as to who you want to inherit this asset. Should Your Spouse Inherit Your Retirement Account? Your spouse can defer taking withdrawals until after they reach 70.5 years of age. After that point, they might take a minimum distribution. If you name a non-spouse as your beneficiary, they will need to take distributions immediately. Your spouse can immediately gain access to the funds without having to wait for them to go through probate. This can provide an immediate source of income to help them pay bills. Your spouse might be incapacitated, in which case he or she cannot manage the money. Leaving funds to your spouse will increase their taxable estate. You might have children from a first marriage who you want to provide for. Leaving your retirement proceeds to your current spouse does not benefit these children unless your spouse agrees to leave them assets in his or her will. Sometimes, you can reduce the negative impacts of leaving assets to your spouse by leaving them to a trust. For example, if your spouse is incapacitated, you can leave the retirement account to the trust and name your spouse as the beneficiary. In this arrangement, the trustee will manage the assets for your spouse’s benefit. Trusts can also provide important tax advantages, but you need to hire someone experienced with creating the right kind of trust for receiving retirement account proceeds. In some situations, a 401(k) or IRA left to a trust must be liquidated in a few years, which will increase taxation. Trusts are also vital if you intend to name someone with special needs as a beneficiary. Disabled people are at risk of losing important government benefits if you leave them assets, including a retirement account. In this situation, funding a special needs trust is a much better option. Estate planning is more complicated today than at any point in the past. Whereas our grandparents were once able to just draft a simple will and forget it, complicated assets require more careful planning. 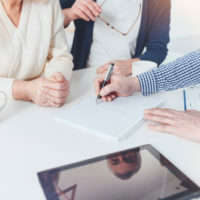 If you have a question about how to draft an estate plan, please reach out to a Florida estate planning attorney at Millhorn Elder Law Planning Group in The Villages. Please call or submit an online question.